1 Boil the kettle. 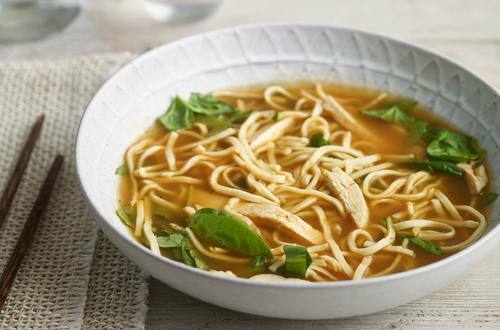 Measure out 900ml of boiling water in a measuring jug, crumble in the Knorr Chicken Stock Cube and stir to make a stock. 2 Pour it into a 2-litre saucepan, stir in the chopped garlic and grated chilli, then bring to the boil. Break in the egg noodles and simmer for 5 minutes until cooked. 3 Stir in the chicken and soy sauce, then cook for a further 3 minutes to warm through. 4 Divide the chopped spinach between 4 serving bowls. Ladle in the soup, making sure each bowl has an equal amount of chicken. Enjoy immediately.